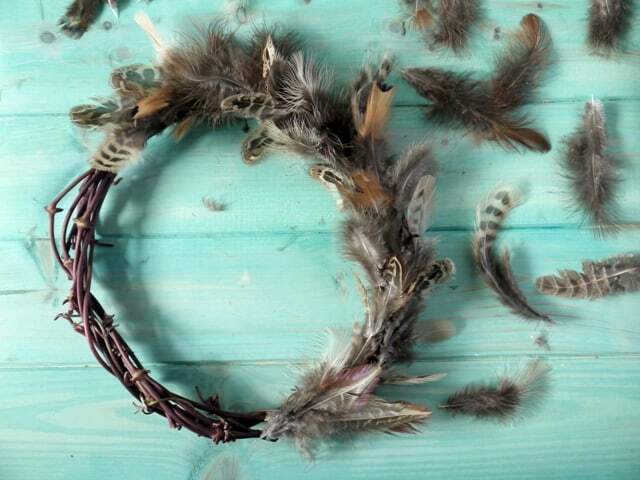 Fancy making your own feather wreath this year? Mine is to welcome in the autumn (hello layers & boots, oh how I’ve missed you!) but why not plan ahead and make a few for the festive season? They make beautiful, natural gifts! Making the feather wreath was so much fun! I used pheasant feathers from the last time a friend went shooting. If you know a good butcher that stocks pheasant, why not ask if they could keep you a bag of feathers? If you have hens or ducks, why not collect up their preened feathers you find on the ground or in nest boxes. And if all else fails, you can always find pretty feathers at craft stores or on ebay. Next, find a few long strands of a whippy plant. Anything that grows with long, bendy branches or vines like honeysuckle, ivy, willow, hazel, clematis etc. You could even use bramble or rose, just slice off the thorns with a sharp knife first. Strip the leaves off the longest strand you have and bend into the size circle you fancy. Wrap the vine round itself until it holds itself together. Entwine the other strands into the wreath, tucking in any loose ends and constantly shaping it into a circle. If you find the thickest part of the vine is snapping, try gently bending it along its length before bending sharply into the circle. Next, work out what size feathers are going to work best for your project. For my largest feather wreath (about 10″ in diameter) I used feather about 3″to 6″ in length. For my smaller feather wreath (about 7″ diameter) I used feathers around 2″ to 5″ in length. I used a hot glue gun to stick the feathers to the wreath. If you want to make this with children you’ll need to find a safer glue as this stuff is HOT. Ask in your local craft shop what they’d advise, or please leave a comment below if you know the perfect glue for kiddies. To make the feathers kick out at the sides, you’ll need to glue the feather upside down (ie with the prettiest side against the wreath). Build up layer upon layer of feathers, each one covering the base of the one before. Until you and up back where you started. Pretty huh? Please feel free to pin this tutorial on Pinterest. And be sure to share your pics with me on Facebook, Twitter or Instagram if you make your own feather wreath! Soooo pretty! I have tons of feathers that I’ve been collecting from my chickens and guineas over the past two years, so now I know what I can do with them. Such a great idea and your wreaths turned out great! Perfect! 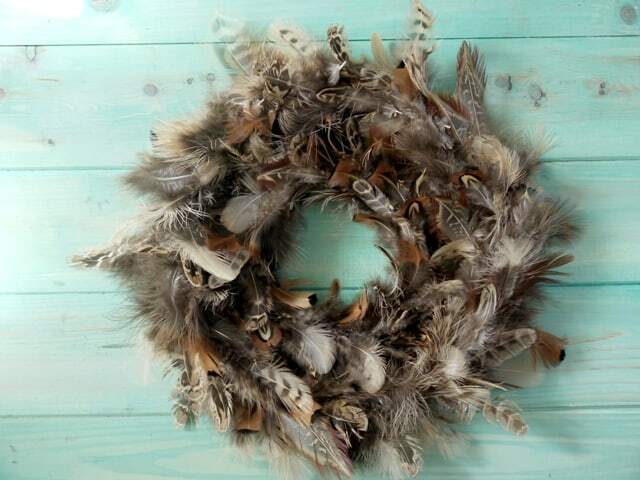 You’ll be able to make a monster wreath with all teh feathers from your flock Tammy! Pahaha, absolutely! That’s claled getting your priorities right GG! Such fun! Now, *scratches head*, where to find some feathers!? Uh oh, no bird will be safe around you Lizzy! Awwwwww. I wonder if I can get OH to do this with the mini chefs. Maybe if I just show him your pictures……. Love how you’re passing the project over! Way to go girl! Why not! If you’re anything like me you probably collect them up without even knowing you’re doing it!